Through innovation, design and technology, to challenge the science of aviation at extreme altitude and conquer new frontiers on Mt Everest and in Nepal. Their goal is to operate a self-funding rescue operation based near Mt. Everest. 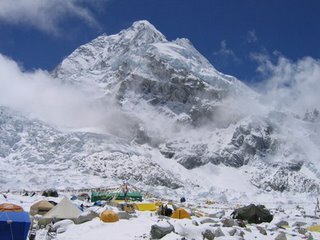 The rescue operation would be for service to mountaineers and also any other high altitude medical emergency in Nepal. They expect that the technology and improved standards for healthcare would benefit the people of Nepal. The rescue vehicle, dubbed the Alpine Wasp, is an unmanned high altitude full sized rescue helicopter designed by TGR. It is a capable of autonomous flight up to 30,000 feet. Generally helicopters cannot operate much above 14,000 feet. The base camp for Mt.Everest climbers is at 17,600 feet (5364m)and the summit is at 29,035 feet (8850m). 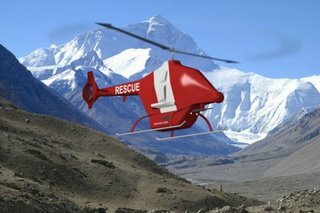 Why an unmanned rescue vehicle? For high altitude rescues a pilot actually gets in the way. The pilot is not acclimated for the altutude or prepared for the extreme cold so they must stay inside the aircraft and cannot help in the rescue efforts. Also, the elimination of the pilot-support equipment leaves room for more rescue gear. The Alpine Wasp is powered by a special diesel engine designed by American company DeltaHawk Diesel Engines. It operates on Jet-A1 fuel which is available in Nepal. The Alpine Wasp will be donated to the foundation later this year after it undergoes extensive testing in the mountains in New Zealnd.